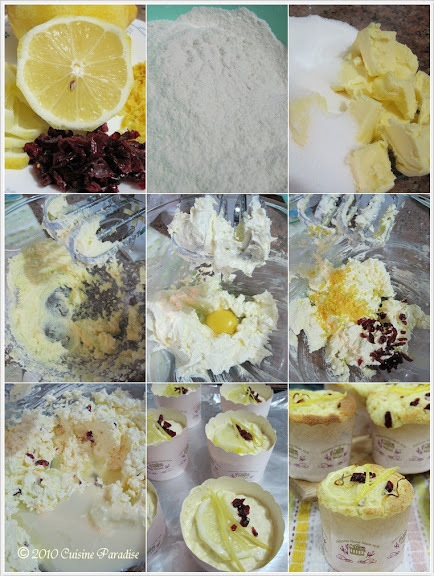 Recently my mum has such a great craving for Lemon Butter Cake that she kept reminding me for a suitable recipe where she can try making some to share with her friends. 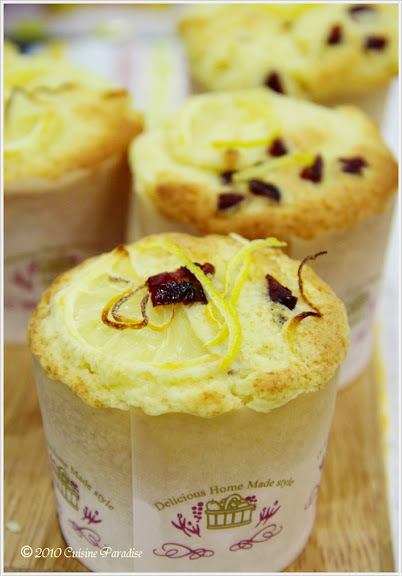 So from her requirements, I managed to come out with some Lemon Butter Muffins which are full of lemon fragrant, taste and sponge cake like texture. 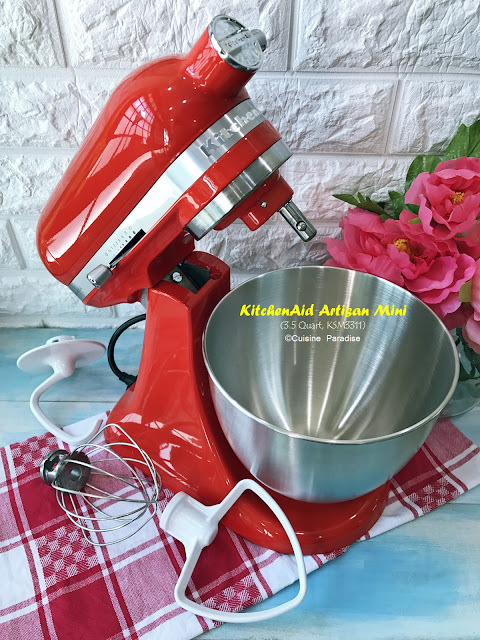 These are some of the photos of the ingredients and steps on how to prepare the batter. 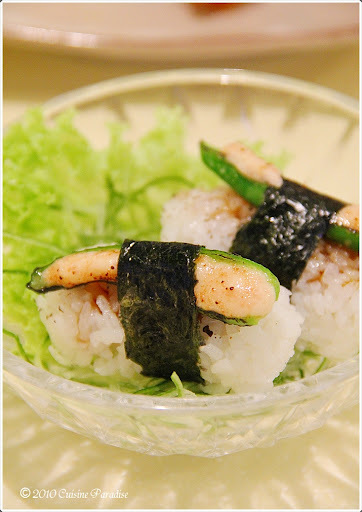 Every month Sakae Sushi will come out with an interesting theme, which consists of a few side dishes to surprise their regular patrons. If you remember, in July they have the Seafood theme follow by Oyster theme in August. As for this month, those of you who have visited Sakae would have already tried their Spicy September dishes where you can find Korea kimchi, Japanese curry, green chili pepper and etc. Out of the 5 spicy dishes for this month we have tried two, above is this “Shishito Mentai Zukushi” where the halve green chili pepper is topped with mentai and wrapped with nigiri sushi. Love the hint of spiciness from the chili and it blends well with the wrap too, this is indeed an interesting dish that reminds us of our local stuffed "Yong Tau Foo". 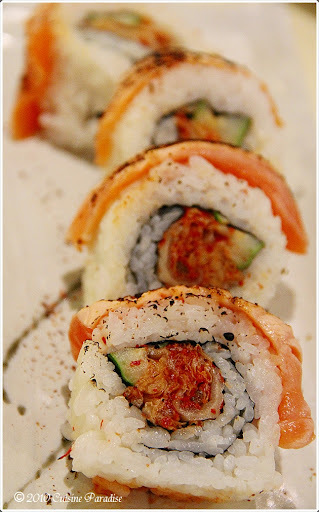 Was quite disappointed with this “Fire Maki” firstly on its outlook which is so different from their menu where it there are some flames over the roll which makes it look so delicious. Secondly instead of that kind of “fire” or rather spicy taste, this roll was rather a bit salty due to the Kimchi and the nori sheet that is wrapped in it taste so chewy and elastic which spoilt the overall taste of this maki. Ebi Fry is one of the ala carte item found under the Agemono category. To be honest this is the first time we tried Sakae’s Ebi Fry as we usually ordered either their Ebi Tempura or Tempura Moriawase. 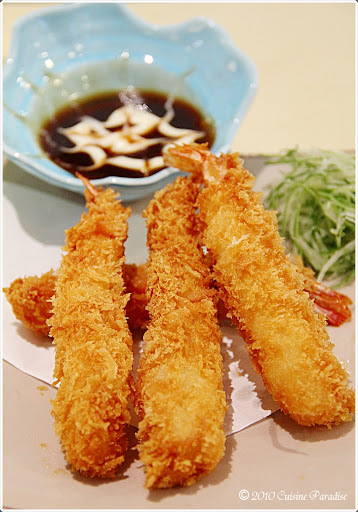 Surprisingly this Ebi Fry is just as good with its crispy and crunchy texture. From their menu, we also spot a great lunch deal at S$20.99 for this “Deluxe Unagi Set” that comes with salad as starter, stir-fried mixed vegetables and prawn, miso soup and rice, Tofu and Venison, Unagi slices cooked with egg and served in foil. Overall this is a steal price with some many items in a set that we think it worth the price for lunch treat. Moreover their venison tastes rather tender, which is not too tough or overcooked when bite too. Now we are already excited to look forward to their October theme, wonder what dishes will they come out with to seduce the taste bud of their patrons. 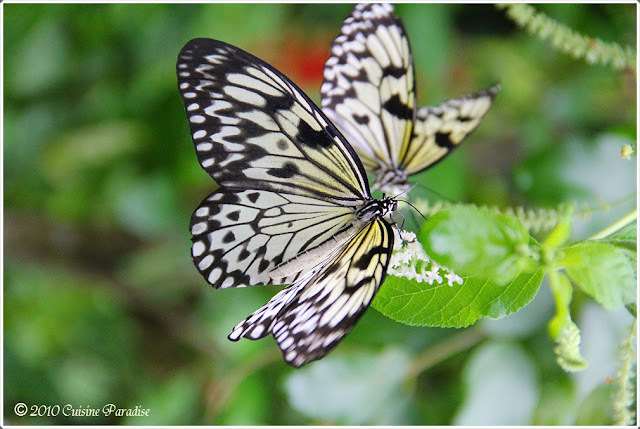 Butterfly Park & Insect Kingdom is one of the top attractions in Sentosa located in the Imbiah Lookout area. 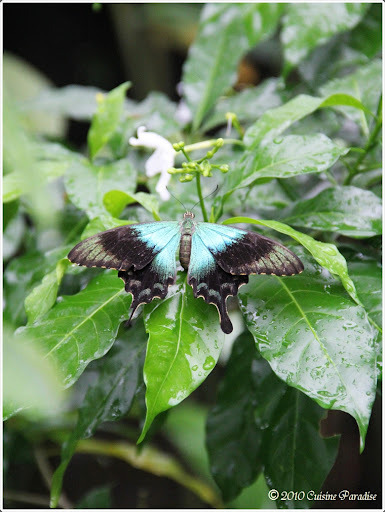 It is surrounded with lush tropical greenery, showcases the stunning beauties of a different variety of beautiful butterflies and interesting insects. Stunning Blue and Black Combo. 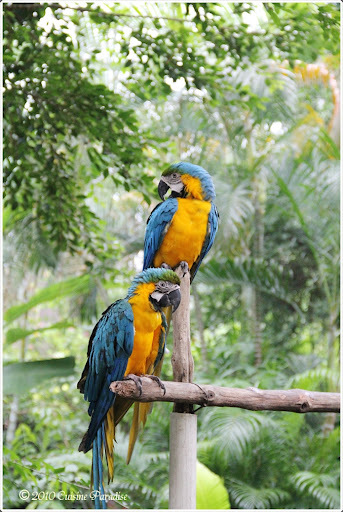 There is an Bird/Animal Aviary where you can get a chance to feed the parrots or take a few photographs with them. For more information about the park, click HERE. For more photographs on the above mentioned post, please click HERE. Let's continue with our recent Sentosa trip from that Candylicious post last week. Since it was a rainy day we can’t do much of the outdoor activities except to stick with some in-door venture. Since AY and her group were keen to visit the Underwater World, we decided to get the 3-In-1 park tickets, which consists of Underwater World, Dolphin Lagoon and Butterfly and Insect Kingdom. Underwater World Singapore (UWS) is situated on Sentosa Island and it is a unique and well-known oceanarium showcasing some 2500 marine life of 250 species from around the regions. Since its opening in 1991 till now, about 30 million of visitors have visited this exhibits and the UWS is always actively involved in regular product renewal and program innovation too. And this round it has being a year and a half since our last visit to the UWS and we do find some changes and new attractions added in it as well. Look at this creature! Can you guess what is this? 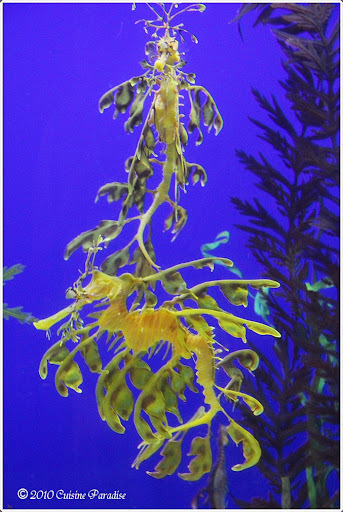 These are some of the beautiful "Leafy SeaDragon" at Mid-foyer level. 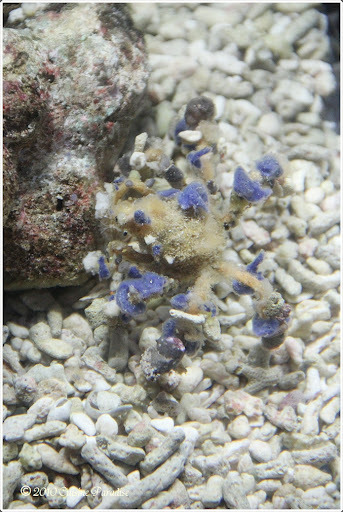 They are given this due to its resemblance to the mythical dragon and the lobes of skin that grow on them also act as camouflage, giving it the appearance of seaweed. 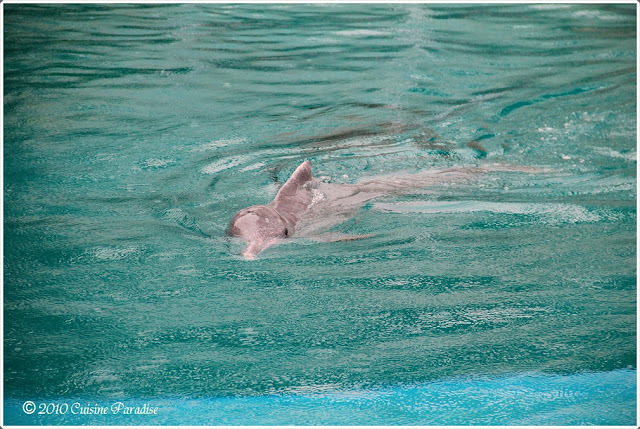 This time round we managed to catch a glimpse of the all-new Dolphin Lagoon which has being moved to its’ new location next to the Underworld World that completes a seamless journey of discovery into the ocean's depths. Look at this!!!!! 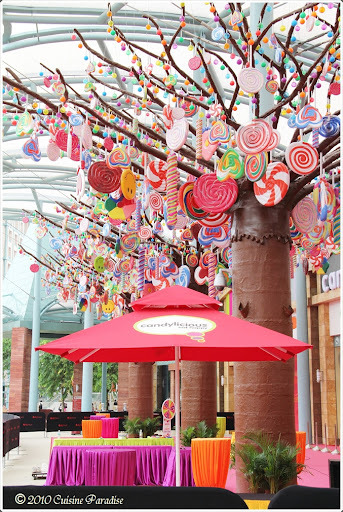 Isn't it beautiful with all the eye-catching “Lollies” hanging high up on the tree? My first sight on it was at a drizzling morning, which makes this a perfect and cooling Christmas atmosphere. This is Asia’s largest candy store known as "Candylicious" that newly opened at Resorts World Sentosa, opposite Universal Studios(USS). Last week, I have friends coming over from Penang, Malaysia for a short trip and Sentosa is always one of the must visit attractions for tourists too. Although the weather for that day was not really good (as it has being raining on and off for the whole day) and the tickets for Universal Studios were Sold Out for the weekends, I am glad that everyone till enjoyed the rest of the attraction around the area. 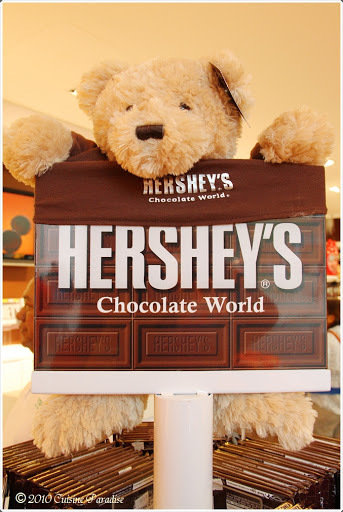 Before Candylicious, Hershey's Chocolate World has already set their foot on Resort World where they store is just a stone throw beside USS. If you are a chocolate lover, I guaranty that you won’t leave the store without grab a bag or so as there are full of verities of chocolate for your selection. 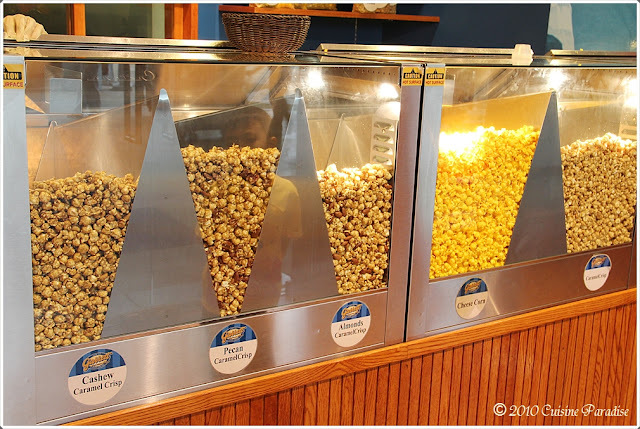 Garrett Popcorn at Resort World Singapore offers a wide range of popcorn choices from Cashew Caramel Crisp, Pecan Caramel Crisp, Cheese Corn and etc. 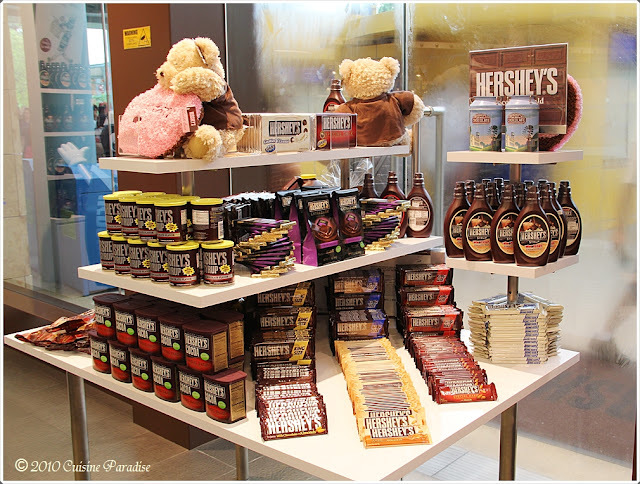 So don’t miss this out too when you walk pass Hershey's Chocolate World, you can also try some sample before getting some. 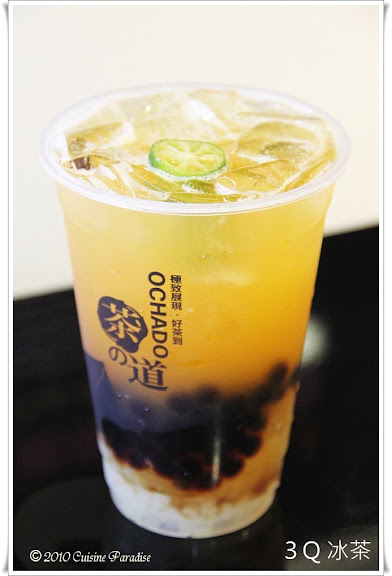 In today’s post, I will be reviewing more about Ochado’s varieties of bubble tea as well as their special toppings, which you might be interested to pair some with your drinks. Ochado is located in the North area, which might be considered as an inconvenient area for certain people. But despite the location, they do served decent flavour of tea that are up to stardard compare to either KOI or Gong Cha. And I am sure good stuffs are worth for the traveling time and who knows it might taste even better compare to those that you have tried. This shop is just about 2 bus stops away from Yishun Mrt station, and you can easily spot it with its outstanding green and black furnishing outlook too. James, who is the supervisor (店长) of this shop, told us that actually this shop is partner by a few bubble tea lovers including himself. Before setting up the shop, they actually flew to Taiwan to do research and learn about the operating procedures and also choosing the right type of tea leave for each item on their menu. Other than over seeing the shop, James also in-charge on cooking the pearls and tea. According to him, they will always discard all the unused tea after every 4 hours to maintain its taste and fragrant and this also applies to the pearls where he needs to discard and re-cooked them every few hours in order for the customers to have soft and chewy pearls. James philosophy is, he values his customers and he always make sure each and every one of their customers can get the best quality of Tea upon purchase. I will review 7 different types of choices, with a few of it are on their popular ordering list. 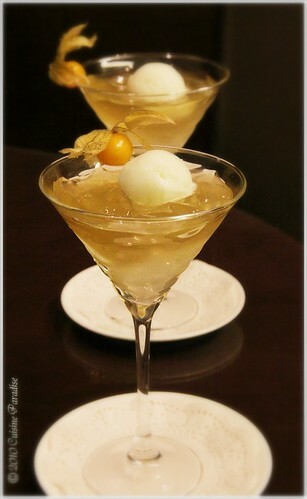 First let’s take a look at this refreshing "OchaDo's Lemonade - 招牌鲜桔茶" which is also known as “Ladies tea” according to James. This is a mixture of green tea with freshly squeeze lime juice (where you still can see the physical lime fruits in it) and top with preserved sour plum (话梅). Great cooling drinks to quench thirst on hot afternoon or after a heavy meal to wash down all the greasy food. You will be wondering what is “3Q” like when we first heard about this name. "3Q Passionate Tea - 百香 ３Q 冰茶" is actually red tea with three types of chewy toppings such as Konnyaku Jelly, Pearls and Aloe Vera. 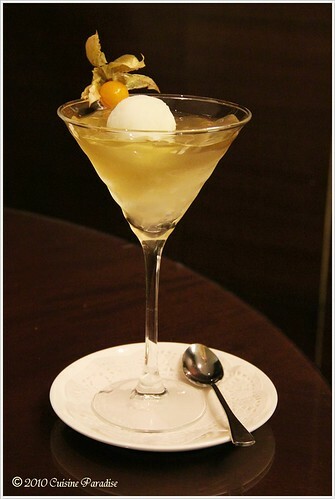 A new combination way to stir up your palate with chewy pearls, crunch aloe vera and soft shredded jelly. But if you prefer something lighter that is not too sour or without any sugar added, perhaps you can consider this “Honey Aloe Vera Tea - 养颜蜂蜜芦荟冰茶” which comes with red tea and aloe vera bits. 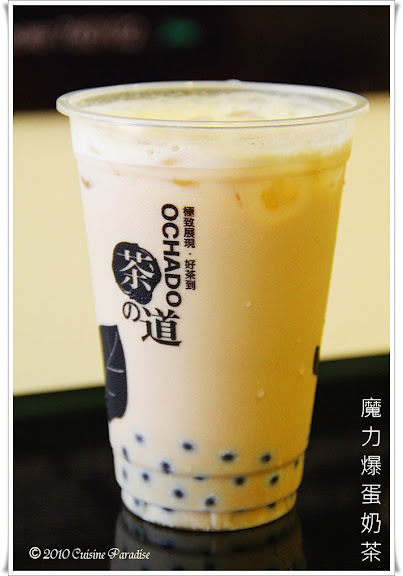 The sweetness of the tea is from honey rather than Fructose (fruit sugar, 果糖) that is used in Ochado’s bubble tea. When you give this tea a sip, you can taste a light honey fragrant in it and at the same time enjoys the healthy bits from the aloe vera cubes. James told us this “Grape Yogurt Aloe Vera - 紫色魔力冰茶” is one of the partner’s favourite drinks, which he will always order whenever he comes to the shop. Although the appearance of this drink might not be very eye catching like those shown above, but if you like graph flavour, this is a good choice. It taste a bit sour when sip but after a few mouthful, it will release a sweet scent that makes you crave more for more which indeed matched well with its Chinese description “紫色魔力冰茶”. For this drink they used genius grape flavour yogurt to blend with the red tea so I guess it’s a good choice for ladies too. 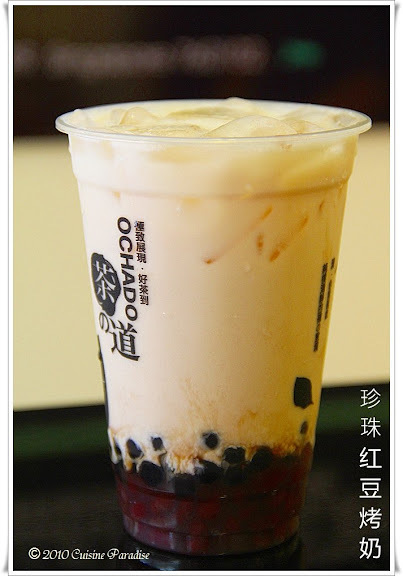 After those non-milk teas above, now it’s time to take a look on our “Star” drinks of the day, “Pearl Milk Tea - 珍珠奶茶”. I am sure more than half of those patrons who visit those bubble tea outlets would usually walk away with a cup of “Pearl Milk Tea”. 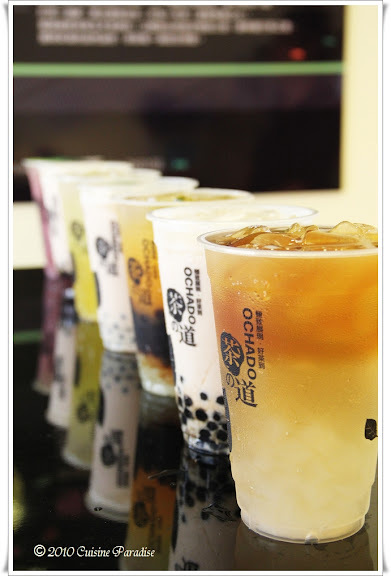 So what are the main criteria you look for to judge a cup of good and recommending pearl milk tea? Is it the aroma of the tea, the taste, or the soft and chewy bubbles or all the above? 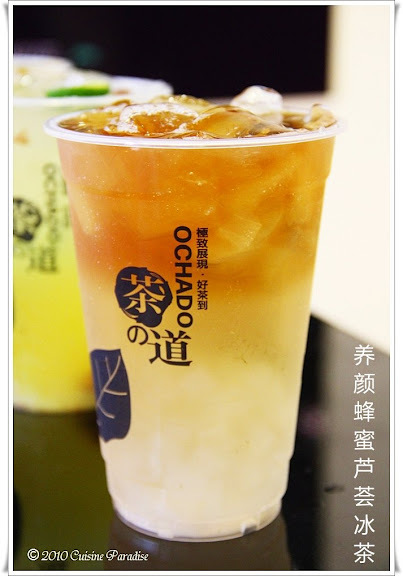 I think I would leave this for you to share with me your comment if you do have a chance to try out Ochado’s Pearl Milk Tea……. “Roasted Tea with Azuki Beans and Pearls - 珍珠红豆烤奶” use roasted tea leaves to brew into roasted milk tea that served together with two different toppings such as azuki beans and pearls. I love the combination of azuki bean and pearls where the sweetness of the beans blends well with the mild taste of the pearls. 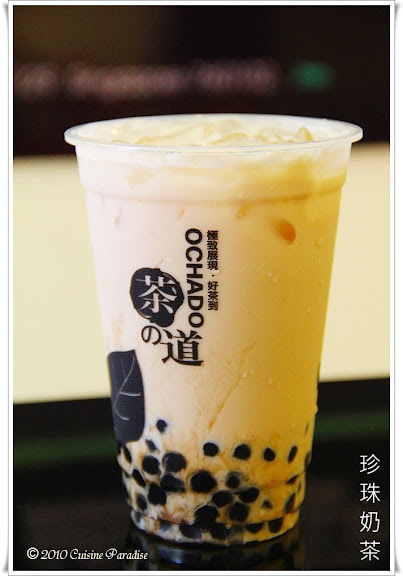 The first cup of Ochado’s tea that captures my heart and attention is their “Okinawan Matcha Milk Tea - 冲绳抹奶茶” which is a blend of green milk tea with azuki beans topping where I also added some extra pearls in it. But this roasted tea with azuki beans and pearls will be more towards the sweet aroma side due to the type of tea used. Finally we are down to the last review for this post on another popular order called “Pop Eggs Milk Tea - 魔力爆蛋奶茶”. Guess you will be thinking, “Pop Eggs” what is that? 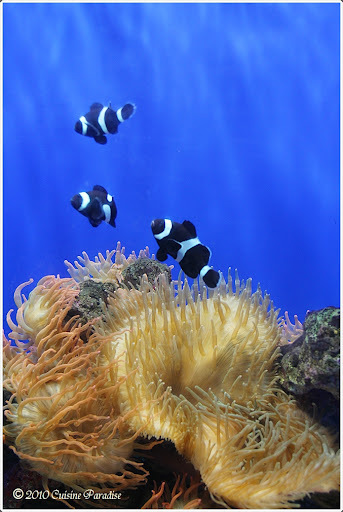 From a glance you might mistaken them as pearls, which they are quite similar on appearance and size. But when you get to try them, you will be surprised! These little “eggs” are actually from Japan and they will burst with some coffee liquid when bites so it a good choice for coffee and tea lovers. Maybe you would like to consider this for change from the usual chewy pearls milk tea if you like that popping effect tickling in your mouth like eating some salmon roes. 1. Coffee Crystal (咖啡水晶) :- which is small cube sizes coffee flavour jelly that is slightly crunchy texture than grass jelly. 2. Konnyaku Jelly (蒟弱):- the jelly is shredded and it comes in two different colour which is white and brown, very unusual to have dual colour Konnyaku jelly in bubble tea. 3. 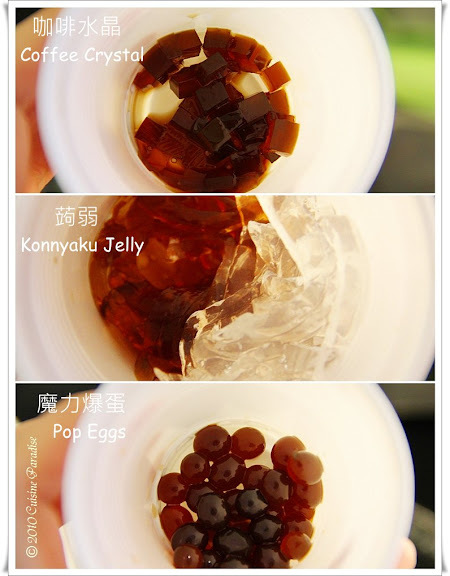 Pop Eggs (魔力爆蛋):- if you like coffee and wish to try something different apart from the chewy pearls or grass jelly, you should go for this toppings. According to the store supervisor (店长), James, these coffee eggs are packed in Japan using freshly brew coffee and it goes pretty well with Mocha or Milk Tea too. 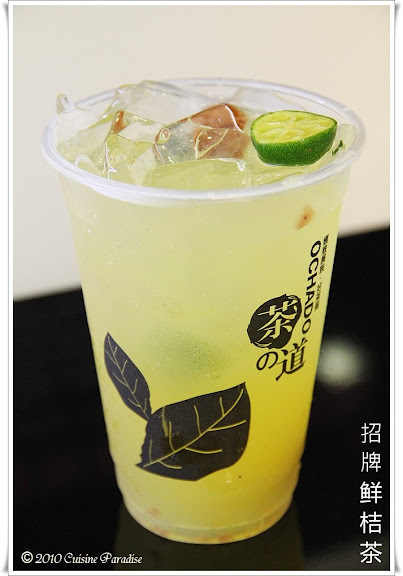 There is another not commonly used topping for bubble tea known as Basil Seed (罗勒子) which in Ochado they have come out with a new drinks known as “Aloe Vera Basil Seed Lemonade - 柠檬芦荟罗勒子”. Maybe I should give it a try next round. 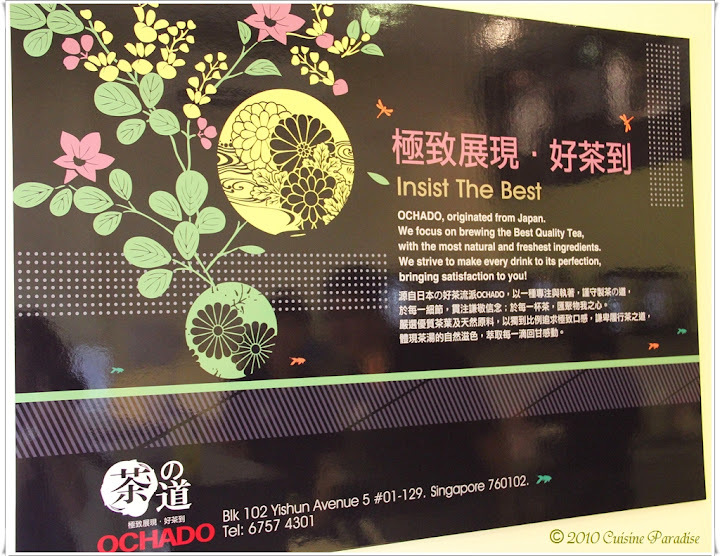 And while chatting with some of the patrons whom are queuing or waiting for their orders, they actually shares and feedback to us that Ochado’s tea has its unique taste which makes it the same stand as KOI café and Gong Cha too. But with this review, I hope it has given you a better idea of what Ochado can offer and perhaps you can drop by one of these days to try it out yourself and share with us your comments. 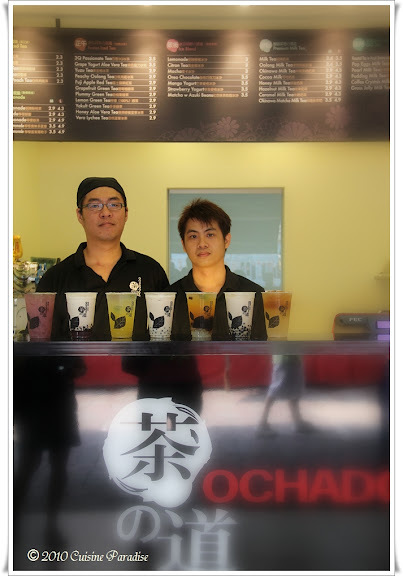 To end the post, Joyce and I would like to thank James (店长) and Noel of Ochado Chanodo (茶の道) for their warm hospitality on inviting us to this bubble tea review in order to for us to share some of their specialise drinks and toppings that might interests you. 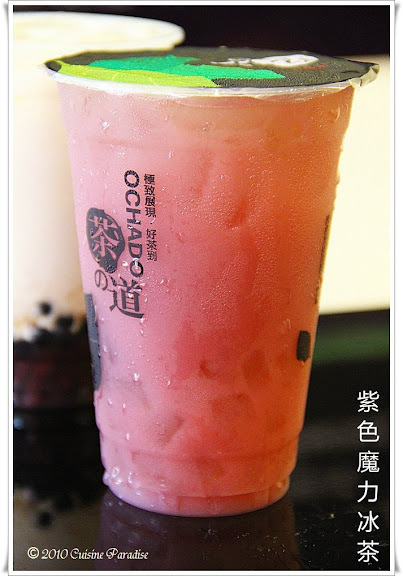 ~ Click HERE for Drinks Menu or LINK for more bubble tea photos. Earlier this week, I was invited to a tasting dinner at Jia Wei Chinese Restaurant together with Maureen from “misstamchiak blog”. 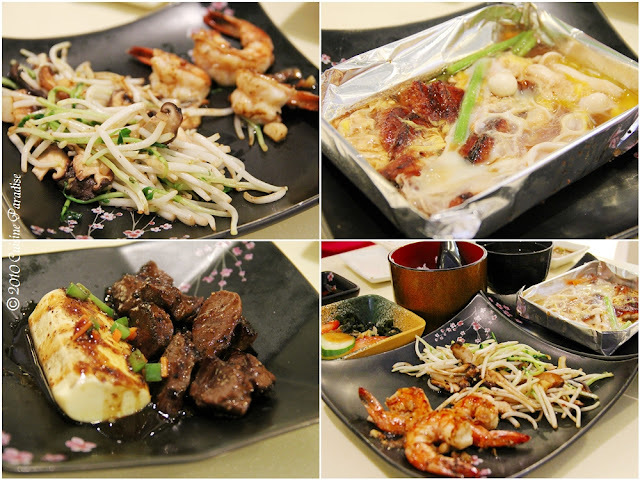 This Chinese restaurant is at level 2 of Grand Mercure Hotel which is located in the heart of Katong that is just 15 minutes away from Changi International Airport. 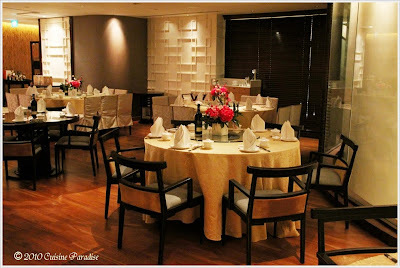 Within the hotel itself, there are two restaurants and bars that serves different varieties of food range from fine Chinese cuisines to authentic Singapore's Traditional Buffet dishes and Western delights. Jia Wei Chinese Restaurant has being operating in Grand Mercure Hotel since December 2007, which will be coming to its 4th years of operation this December. 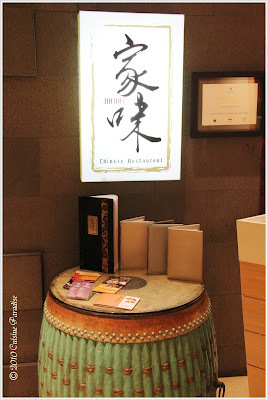 This Chinese restaurant offers an exquisite and oriental fine dining experiences with its fusion Chinese cuisines created by its award-winning Chef, Lee Tuck Seng (李德胜). Chef Lee brings with him over thirty years of culinary experience culled from his various postings in various renowned hotels and restaurants. His is specialised in Cantonese cuisine where he always continuously refines the art of cooking through improvisation and experimentation. I love what Chef Lee’s has code for his philosophy towards his work; “Put your whole heart in it and your plates will reflect it”. 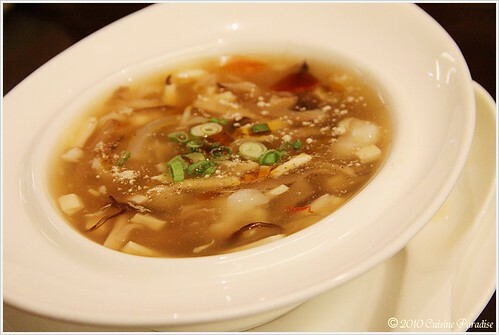 To start off with the dinner, we each have a bowl of “Hot & Sour Soup” as starter before the main dishes are served. The taste of this soup is just nice for our liking as it is neither too spicy nor sour compare to most of the Szechuan Hot and Sour Soup. 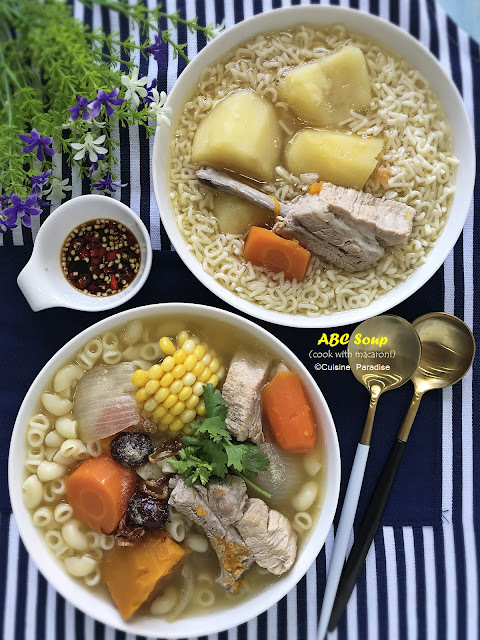 According to Chef’s Lee, he actually used “white peppercorns” that makes the taste mild instead of the usual “Szechuan Peppercorns - 花椒 “ which gives a more numb and spicy taste to the soup. And I must agreed this is quite an appetising soup to stir up our appetite for the upcoming dishes. 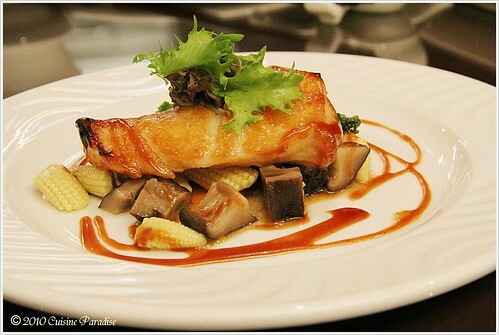 "Grilled Cod Fish with Chef's Special Sauce" is my favourite pick out of the 5 tasting dishes from the menu. From what Chef Lee has shared, he actually used some salted plum (水梅), tomato sauce, chilli oil and etc to create this sweet sauce which I think it has a quite similar taste towards Teriyaki sauce. With this suace, he used it to brush on the cod fillet before and during the baking process in order to achieve the attractive golden brown colour on the surface of the fish. There are also some side vegetables such as baby corn, mushroom and broccoli that makes a great combination with the drizzle sauce too. 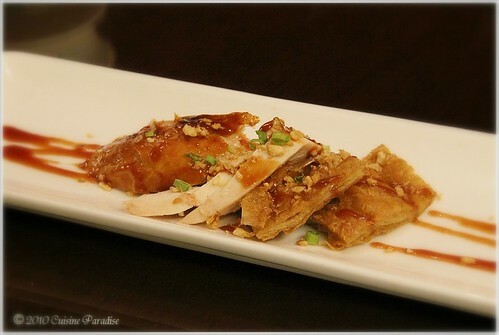 This “Roasted Chicken with Garlic” platter comes with a few pieces of roasted chicken and Mock Goose (素斋鹅 - usually you will find this crispy bits served on top of the vegetarian bee hoon) that tops with some crispy fried minced garlic. The chicken has a very crispy outer skin and surprisingly the meat is still very tender and juicy when bites. If you prefer, you can eat this with their special chilli sauce which I think goes pretty well with the chicken. 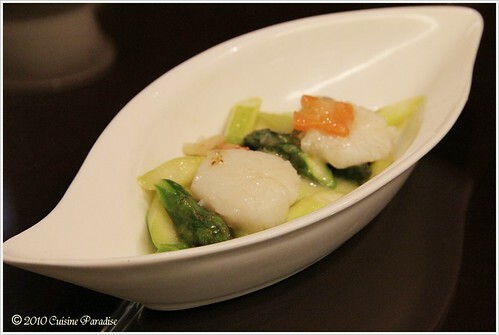 For vegetable dish we had this "Stir-fried Scallops with Asparagus" which you can still enjoy the fresh and crunchiness of the thick asparagus slices. 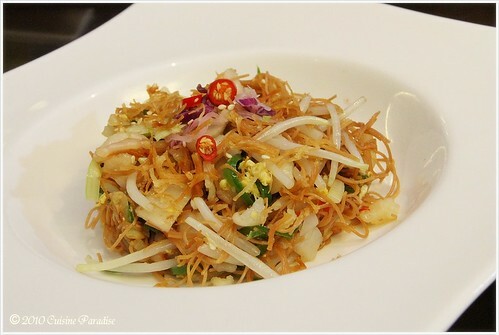 Homemade Fried Mee Sua is also one of my favourite noodle dishes other than Braised Ee Fu noodles. I have tried this similar fried mee sua dish in a few restaurants before and the one served at Jia Wei has definitely more “hidden” ingredients. Bad sad to say, this is not the best fried Mee Sua as compare to what I had eaten before, perhaps too many ingredients adds complexity to the taste of this dish. Having a cup of this wonderful "Chilled Aloe Vera with Lime Sorbet" is definitely a good choice from the array of desserts on the menu. This dessert consists of 3 different textures such as the Aloe Vera cubes at the bottom of the cup that gives you crunchy bites, middle are some soft and silky jelly follow with a scoop of Lime Sorbet on top. The Lime Sorbet was kind of sour but it actually blends well with the jelly and Aloe Vera, which made this a very refreshing dessert after those dishes. While chatting with each other during the dinner, I was sharing about my passion towards using Durian as an ingredients in my recipes blog when Jennifer suggest that in this case we must try their special Durian desserts which is available in their Ala Crate Menu known as "Deep-fried Durian Ice-Cream" and "Durian Paste" from Feast @ East Buffet Restaurant that is located at level 3. 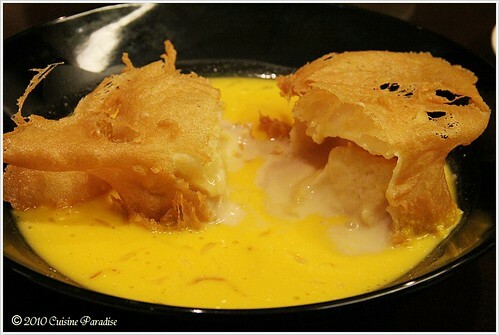 This is indeed a special Durian dessert where the Ice Cream is coated with a layer of batter and deep-fried till golden and crispy. This must be done in a skillful way in order to achieve the right crispy texture for the outer wrapper and yet retain the ice cream from melting in the parcel. The ice cream parcel is then served with mango puree sauce together with some pomelo in it which you reminds you of the Mango Pomelo dessert(杨枝甘露). Overall the taste of the mango sauce goes pretty well with the ice cream parcel, but if you don't wish to mix the two flavour, you can mango sauce and just enjoy your durian parcel where the ice cream will starts to ooze out when bite. The second Durian dessert is specially taken from Feast @ East Buffet Restaurant that is located at level 3 of this hotel. 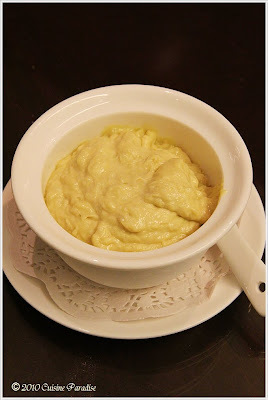 Personally I will still prefer the Deep-fried Durian Ice Cream than this Durian Paste, as I love the bursting layers of flavour from the crispy outer skin, durian and mango puree. After the dinner, Maureen and I each received a box of complimentary “White Lotus Seeds with Macadamia Nuts” mooncake as mooncake festive season gift from Jennifer, Director of Sales & Marketing department of Grand Mercure Hotel. 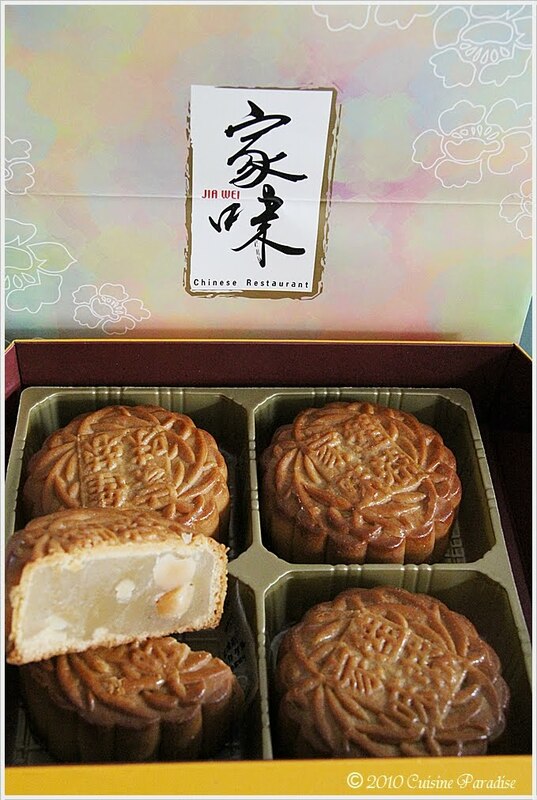 Other than baked mooncake, this year Jia Wei also came out with a new flavour snowskin mooncake known as “Moonberries”. With its high nutrient contest and antioxidant qualities, this ruby-red juice is the perfect ingredient for a mouth-watering mooncake selection suitable as gifts or personal consumption. If you are interested to get some as gifts, you can refer HERE for more details. 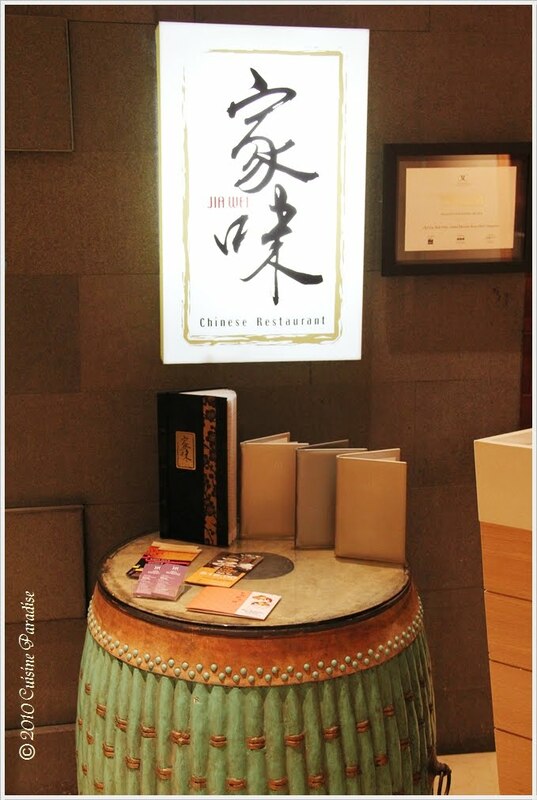 Recently Jia Wei has also launched an Executive Set Menus, which is specially created for busy executives. This Executive Set Menus (refer to their online menu list HERE) contain 4 separate menu sets, each of which boasts a selection of 4 menu choices. The 4 menu sets are rotated on a weekly basis, which mean you could enjoy a different choice from the extensive choices from each menu set. But if you prefer something more rest and relax, perhaps you can consider their “Yum Char” High Tea that comes with varieties of dim sum, noodles and deserts. This Yum Char High Tea is available from Friday, Saturday and Sunday from 11.00am to 5.00pm. Despite on the High Tea time, Dim sum is also available on daily lunch menu. Lastly, I would like to thank Ms Jennifer Narcis of Grand Mercure Hotel, Roxy Singapore and Ms Vanessa Koh of Asia PR Werkz Pte Ltd for hosting this tasting event. 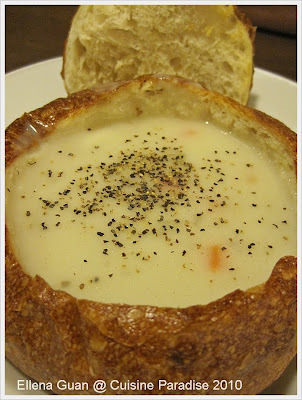 To start off our dinner at Swensen's, we have the "Clam Chowder" soup that is served in a sourdough breadbowl which is enough to feed two person due to it's huge serving. The soup is full of yummy ingredients such as baby clams, diced potatoes, carrot, onion and etc in creamy soup. 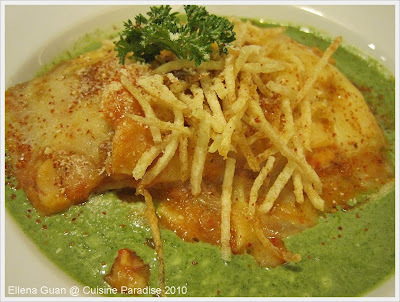 Here comes our main course which is the "Seafood Lasagna" with succulent shrimps and crab sticks between generous layers of pasta that accompanied with that attractive jade green creamy spinach sauce and topped with golden fried potato sticks. This dish might look good but it taste rather cold which we thought it might have being taken out from the freezer and just reheat in the microwave or so. And when eating, this cold dish gives us that greasy and odd feeling too. For dessert, we ordered this "White Chocolate Blondie" and "Sticky Chewy Chocolate". 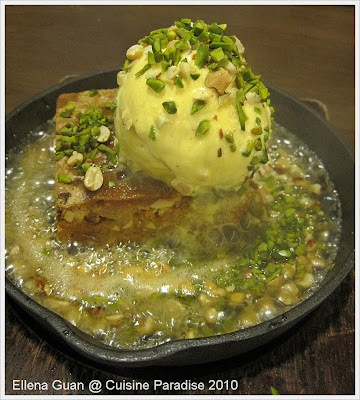 The Chocolate Blondie is filled with rich white chocolate blondie sizzling with maple butter syrup and served together with Ol' Fashioned Vanilla ice cream and a shower of pistachios, peanuts and almonds. 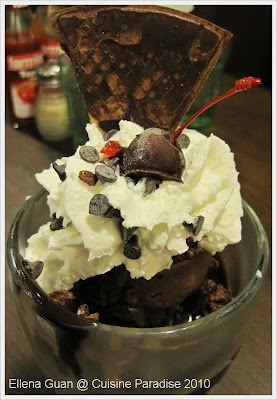 This really taste great for after meal dessert and it makes you crave for more after each mouthful. My boy's favourite dessert which is "Sticky Chewy Chocolate" that he loves so much because the whole cup is full of chocolate! 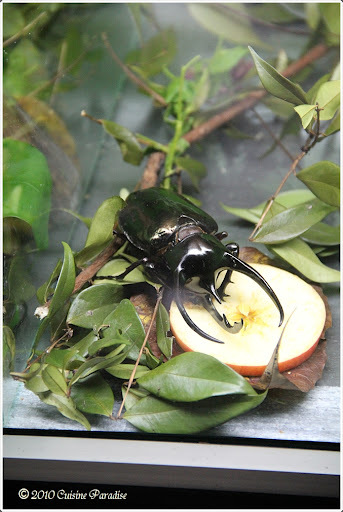 But before eating, he will scoop off all the whipped cream which he dislike the taste of it. This Swensen's outlet at North Point Shopping Mall has being around since the opening of the shopping mall more than 10 years. And their newly renovated concept do add extra points to the dining environment.